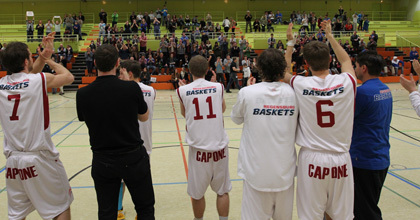 The Regensburg Baskets learned plenty during their promotion season in the 2nd Regionalliga SouthEast. They were also forced however to learn through plenty of mistakes while figuring out how to build up a successful club. But after securing a second season in Germany’s fifth division, Baskets general manager Alexander Ziegler sought the advice of one of the most experienced basketball minds in all of Germany – Brose Baskets general manager Wolfgang Heyder. Ziegler met up with the Bamberg boss on April 1 – one day after Regensburg staged their successful final home game, a win over BBV Leipzig to stave off relegation. Ziegler said the goal of the chat with the head of the two-time reigning Beko BBL champion was to exchange ideas as well as discover which mistakes to avoid and learn about the next steps Regensburg could take. Even though Heyder is busy worrying if his team could three-peat with the German championship and about his roster for the 2012-13 campaign, the Bamberg leader knew of the Regensburg basketball project. “I was pretty impressed that he knew pretty well about our situation even though he has a lot to deal with himself,” said Ziegler. The two basketball heads talked for nearly 20 minutes and Ziegler took a lot from the informal chat, especially in how to “implement sensible structures and the distribution of tasks”. There is so much to organize at home games and Heyder said it’s important to coordinate individual duties sensibly and effectively. Ziegler said he also plans on working to find others to coordinate the practice times for all the teams within the club within a schedule of gym availability. Ziegler said he was convinced following the talk that he needs to add more personnel into the club’s structure. He must also have “patience and perseverance” while also practicing “sound economics”. Heyder also made suggestions about advancements within the youth ranks in the Upper Palatinate club. Regardless the success of Regensburg’s top men’s team, the youth development is a critical component for long-term sustainability and success, said Ziegler. And he hopes to continue to expand the club’s youth concept. Even though Regensburg’s home game against Leipzig was considered a successful event as well as result, Ziegler said the talk with Heyder “gave me a extra push of motivation”. The Regensburg boss thought Heyder was very cooperative. “He seemed to have a special interest in expanding the foundation of basketball since there is not really much basketball in eastern Bavaria,” Ziegler said of Heyder. Ziegler has been the past three weeks intensively considering how to implement the tips he received from Heyder to continue the Baskets’ development. One thing is certain. Ziegler’s talk with Heyder has already given the Regensburg Baskets a major push forward – if nothing else because they avoided the mistakes they may have made without the talk.